Crystal clear, crisp printouts are what the DeskJet 5160 is renowned for. After some time your HP 5160 will run low on printer ink, and then you'll soon realise that fresh HP DeskJet 5160 ink is typically expensive. But you have no reason to be anxious about shelling out the high purchase prices you'll see on the high street because now at Cartridge Save you can pick up all the HP 5160 cartridges you will want at very competitive prices. Save more money on your ink by shopping online with Cartridge Save! Why pay more to get the 5160 original cartridge or 5160 compatible ink in the high street when you can save a bundle of cash shopping with Cartridge Save. You have full satisfaction when purchasing DeskJet 5160 ink cartridges from us because every single one is guaranteed by a hassle-free money back guarantee. Take into consideration that every purchase comes with free delivery, most likely delivered to your door the very next business day! More suitable for home use than business use, the HP Deskjet 5160 produces professional-grade colour reproduction and fast print speeds and the versatility of optional wireless interface and auto-duplex printing. It allows borderless printing for photos, and boasts up to 4800 optimised dpi in colour. The HP Deskjet 5160 is a good household photo printer, but it can be a bit noisy to operate. Running costs are notoriously high because it is an inkjet. 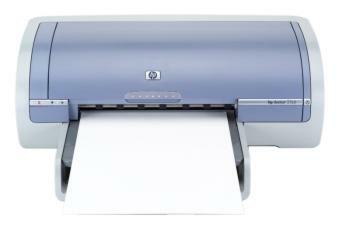 The HP Deskjet 5160 comes in a blue and grey finish, with the paper tray doubling as the feed tray and paper catch. USB interface is standard, and wireless connection and Ethernet are optional. The HP Deskjet 5160 uses the PhotoRet 4 colour layering technology from HP, plus an optional 6-ink configuration for better colour reproduction. The HP Deskjet 5160 boasts print speeds of up to 19ppm in black and 14ppm in colour, and allows borderless photo printing for outputs as large as A4. The device also comes with the HP photo and imaging software that allows you to enhance, organize, and share images. It boasts excellent features for a single-function, and the addition of wireless configuration makes it a good choice for multiple computer environments. Customers often complain about the noise that the HP Deskjet 5160 produces while in operation. Otherwise, it is a good value printer with fair running costs.